I have to say, having a race at your local course is always fun. You get to wake up in your own bed and eat breakfast that you cooked on your stove. It’s just a nice perk. Not to mention that you also know the course well. That’s always useful. So yesterday, I did just that. I woke up early and headed out there. The weather was cool and drizzly, which was a bit different than the frigid, sunny day that the race was last year. I started with everyone else at the bottom of the first climb at the start of the lower loop, rode up the first mile or so in the middle of giant pack of bikers. For at least 2 miles after we hit the single track, we were pretty much tire to tire. After that, we managed to break apart into smaller groups of just a few. I rode well on the lower loop, kept a good pace and didn’t get passed by hardly anyone unless I stopped. I swung through the feed zone, ate some gummy thing, finished off my water, grabbed more and took off to the upper loop. This is where my race went down hill. I got a flat. I tried to get my sealant to seal, but it wouldn’t. So I had to put in a tube into the tire; I basically changed the same tire twice. It took about 10 minutes to do it all, and all the friends I made on the trail passed me. I noted their names and put them on the list. The list of people that I had to catch. Sadly, I didn’t catch all of them. I caught one of them, then crashed. It wasn’t a bad one, but it slowed me down a little. So I caught that one again, caught another (Ann) and crashed hard. I’m not really sure what happened, my front wheel slipped out or hit a rock wrong and my bike stopped, and I went a little ways further without it. I slammed hard on the dirt, narrowly missing very hard rocks, and bruised my elbow and scraped my calf. My bike was okay, besides the fact that my wheel didn’t point the way my handlebars did anymore. I quickly fixed it and worked on catching Ann again. This is the second time that Ann’s passed me so far, and I’m not opposed to being ‘chicked’, I just am opposed to just being passed in general. So I knew I had to catch her and pass her again. She’s not a particularly fast rider, but she’s got quite lead on me now and I’m in pain. AAAAAANNNNDDD both quads cramp. It is probably one of the most painful things I’ve felt. They weren’t little cramps either, these were full on from knee cap to mid-thigh on both legs. They are locked straight and I can’t think. I do remember the phrase rolling around in my head “Don’t cuss, don’t cuss” as I let out some moan/yell of gibberish. And I also have to figure out how I’m not going to fall over, since I’m brake standing with legs that I can’t move and in extreme pain. I somehow manage to unclip my cleats stiff-legged and get off the trail. I collapse into a kneeling position and just sit there. I reach over and manage to manhandle my bike out of the path. I eventually recover after more stretching and letting my legs get the cramps out. And I catch up to Ann and pass her. I end up crossing the line at 3:23:28, catching 3 of the 4 people I wanted to catch. Last year I finished around 3:34, so I shaved 11 minutes off of my time. I am just left here wondering what would have happened if I didn’t get that flat and I happened to drink more water. Would have I been able to do it in 3:10? Sub 3? I guess I’ll have to wait till next year to find out. 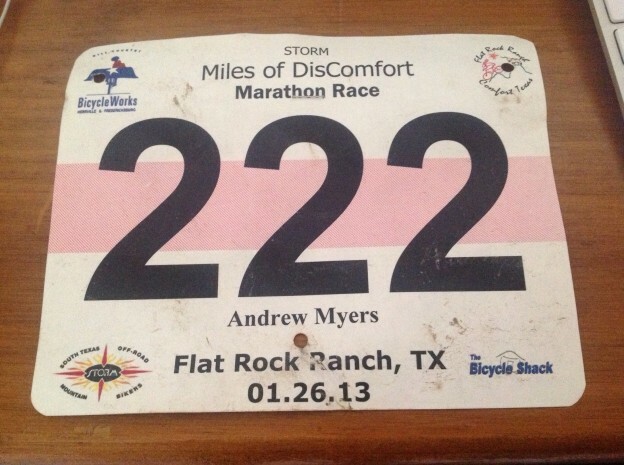 This entry was posted in Bike, Racing on January 27, 2013 by Andrew. My name is Andrew and I really, really, really like riding my bike.